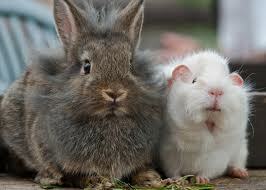 Welcome to our page looking at the relationship of guinea pigs and other animals. This is an index of posts we have written on their relationship with each animal and their food as well. If there is no link in the post title, it means we haven’t written the post yet 🙂 But its on its way! Can guinea pigs and dogs live together? Can guinea pigs eat dog food? 6 reasons why guinea pigs and hamsters can’t live together. Can guinea pigs eat cat food? Can Guinea Pigs and Rats Live Together? Can guinea pigs eat rat food? Can Guinea Pigs and Gerbils Live Together? Can You Mix Guinea Pigs and Chinchillas? Can Guinea Pigs Eat Chinchilla Food? Can guinea pigs and mice live together?